A Pennsylvania State Trooper shot on I-676 is back home with his family. CENTER CITY (WPVI) -- A Pennsylvania State Trooper shot Tuesday on I-676 in Center City Philadelphia has been released from the hospital. With a cheer of "Let's go Eagles," Trooper Patrick Casey, 31, left Hahnemann University Hospital late Wednesday morning. "Thank you everyone for all their prayers and support. Happy to be going home for Thanksgiving. I'm feeling much better." Casey said as he walked away from the hospital to a waiting car. 17-year-old Giovanni Cotto, has been charged, as an adult, in the shooting. He is charged with Criminal Attempt to Murder of the 1st Degree (3 Counts), Aggravated Assault (3 Counts), Assault of Law Enforcement Officer (3 Counts), Simple Assault (3 Counts), Fleeing and Attempting to Elude, Recklessly Endangering Another Person, Possessing Instruments of Crime, and several Firearms Act Violations. He was formally arraigned by video Wednesday morning, and bail was set at $3 million. The 17-year-old suspect returned to State Police Barracks in Wynnefield Heights Tuesday night after being treated for injuries sustained in the incident. When being brought out of the barracks, Cotto told Action News he had "not a thing" to say about the shooting. 17-year-old Giovanni Cotto has been charged, as an adult, with Criminal Attempt to Murder of the 1st Degree, Aggravated Assault and related offenses. He was in a green jumpsuit after he was served a search warrant for his clothes he was wearing to be examined for gun residue. Police announced on Thursday the arrest of a fourth individual involved in Tuesday's chase and shooting. The person of interest is identified as 19-year-old Kaymer Lewis of Philadelphia. They say no charges are pending against him, they just want to speak with Lewis. Anyone with information regarding his whereabouts should contact police at 215-452-5216. Investigators say most of the incident was captured on Trooper Casey's dash cam. The incident began around 9:30 a.m. on I-76 at University Avenue where Pennsylvania State Troopers conducted a car stop on a vehicle for expired registration. Police say there were four males inside the car, all of whom were removed from the vehicle by officers. One of the individuals was handcuffed at the scene. One of the other males, the alleged gunman, got back into the car and suddenly took off. Troopers gave chase, leaving the other three individuals behind. Two of them took off. Police followed the suspect's car westbound on I-76, then eastbound on I-676. Trooper Casey got in front of the suspect in an attempt to conduct an induced stop. However, the suspect rammed the trooper's vehicle. Police say the suspect then maneuvered to be alongside the trooper, at which time the suspect began firing from his car. The suspect's vehicle then slammed into the rear of a school bus on the highway. The suspect got out and continued to fire on the pursuing state troopers. Trooper Casey immediately began to return fire, firing eight shots through his windshield. During the exchange, he was struck once in the shoulder. 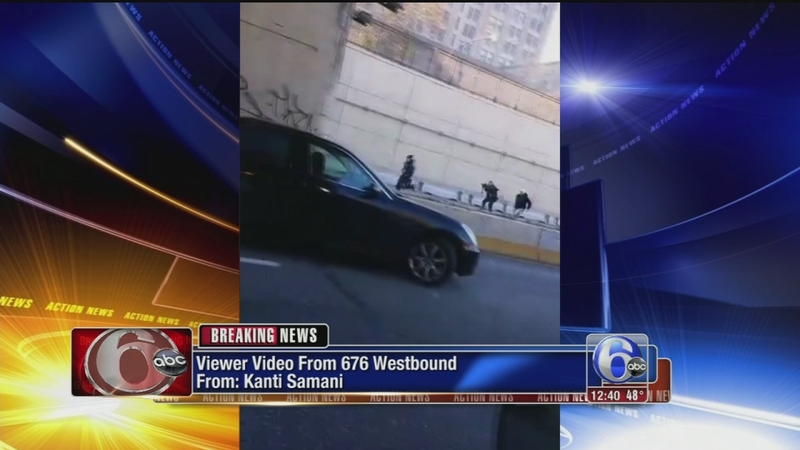 Action News viewer Kanti Samani captured part of the confrontation between state police and suspects on I-676. The suspect's vehicle then caught fire, and the flames spread onto the bus, soon consuming both vehicles. Luckily, there were no students on board the bus at the time of the crash, and the bus driver was not injured. Other troopers rushed Casey to Hahnemann University Hospital. Captain James Raykovitz of the Pennsylvania State Police said, "He was very heroic, he put himself in harm's way for the protection of others; I can't ask him to have done a better job than he did." The male who was handcuffed and another were questioned and released. They have not been charged. After hours of being questioned at the barracks, the 17-year-old alleged shooter was taken to Lankenau Medical Center complaining of leg pain. He was then brought back to the barracks. The gun he allegedly used was recovered at the scene. Police say the gun was originally purchased in 2009 in Texas and was stolen in a burglary in Georgia in 2011. The suspected gunman's father Hector Cotto walked out of police barracks Tuesday evening telling reporters his son is a good boy who just made a mistake. The father of the 17-year-old suspect spoke to Action News. "He's a good kid. I don't know. He made a wrong decision today," the father said. The father said he does not know where his son got the gun or if it belonged to the teen or someone else. "My son, I love him with all my heart. That's my son. I'm going to be there for my son. No matter what happened, I'm going to be there for my son," the father said. "My thoughts and prayers are with the Pennsylvania State Police Trooper shot on Interstate 676 in the line of duty today. I received an update from Acting Commissioner Blocker a short time ago and I am relieved to learn that the trooper is in stable condition at a hospital in Philadelphia. Our men and women in law enforcement put their lives on the line each day to protect us, and we owe them a debt of gratitude. The shooter was swiftly taken into custody by the Pennsylvania State Police. No further details are available at this time." I-676 was shutdown for several hours while crews worked to clear the scene. The highway has since reopened. Police said they would not be able to tell Action News if any the individuals in custody or on the loose have a criminal past.